Congratulations, we've made it to Friday. I'm Amrith Ramkumar, getting you caught up on the latest in financial markets as we wrap up the first quarter. Futures are rising, with stocks on track for weekly gains and their best quarter in several years after edging higher yesterday. Wells Fargo shares are higher premarket after the bank said CEO Tim Sloan is retiring. We're awaiting fresh inflation data this morning after a second reading of fourth-quarter GDP was in line with expectations Thursday. Plus, our Akane Otani explains how today's data on household spending could impact the bond market. Tune in for a live conversation today at 1 p.m. ET with our Spencer Jakab and Justin Lahart from the Heard on the Street team. They'll be chatting about what's ahead for the markets as we approach earnings season. Register here. 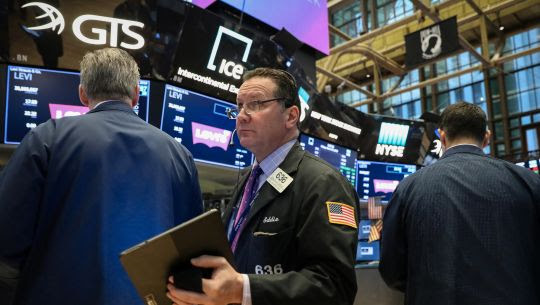 Global stocks rose at the end of the week as hopes for a fresh round of U.S.-China trade talks outweighed lingering worries that the global economy was cooling. Rallying government bonds are about to face their next test with fresh data that will show whether inflation firmed at the start of the year. The Commerce Department is scheduled early this morning to publish its report on personal-consumption expenditures, a gauge of household spending on everything from coffee to healthcare. Traders closely watch the report, since it’s the Federal Reserve’s preferred measure of inflation. Data at the start of March showed the gauge fell short of the central bank’s 2% target in 2018 for a seventh straight year—strengthening officials’ argument to possibly leave interest rates untouched for the rest of 2019. The combination of a cautious Fed and tame inflation has helped U.S. government bond prices rise throughout the year. Inflation is considered a threat to bonds because it chips away at the value of their fixed payouts, so signs that it hasn’t raced higher have helped Treasury prices climb. 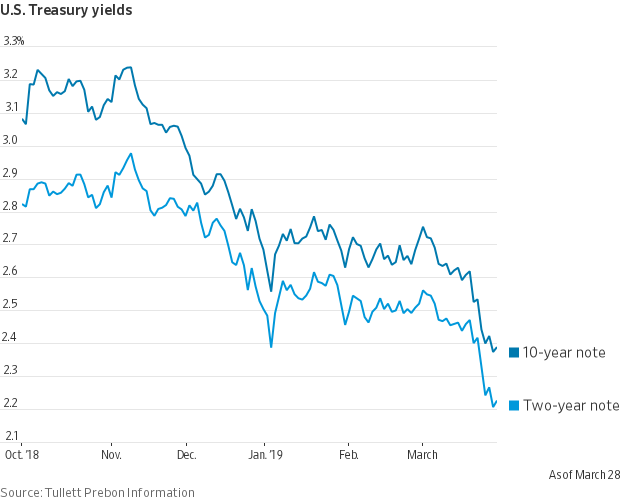 The yield on the benchmark 10-year Treasury, used as a reference for everything from mortgages to student debt, ended Thursday at 2.389%, hovering around a 15-month low. Yields fall as bond prices rise. Few are expecting the Commerce Department report to show a significant uptick in consumer prices. Economists expect the data to show prices for goods and services rose 1.9% in January from a year earlier, matching December’s 1.9% increase. That should help keep Treasurys on track for a strong end to the quarter—as well as boost bets that the Fed will either hold interest rates steady or lower them by the end of the year. Federal-funds futures showed on Thursday the market pricing in no chance of a rate increase by the end of the year, according to CME Group. That’s a stark shift from last fall, when futures pointed to expectations of about two rate increases. Still, some analysts believe it’s too early to rule out a rebound in inflation, especially with data showing wage pressure picking up. Wages rose in February at the fastest pace in nearly a decade. While slumping yields suggest the market is pricing in a yearslong period of sluggish inflation, “that’s not our base case now, and it’s unlikely to become our base case as long as wages are rising above 3.0% and the Fed refrains from further tightening indefinitely,” said Thomas Tzitzouris, vice president and head of fixed income research at Strategas, in a note. Now up 12.3% for the quarter, the S&P 500 is on pace for its best first quarter since 1998. Stocks are on pace for their strongest performance in any quarter since September 2009. Front-month gold futures fell 1.6% Thursday, their largest one-day slide since mid-August. Prices of the haven metal are up slightly for the year but 4% below February's 10-month high. A steady dollar has hurt gold by making it more expensive for overseas buyers. On this day in 1989, Michael Milken was indicted on 98 felony charges of violating federal securities laws as head of the junk-bond desk at Drexel Burnham Lambert. Prosecutors disclosed that he earned $550 million in compensation in 1986. U.S. personal income for February is expected to rise 0.2%. The figures will be released at 8:30 a.m. ET. U.S. consumer spending for January, also slated for 8:30 a.m., is expected to increase 0.3%. The personal-consumption expenditures price index, excluding food and energy, is expected to rise 0.2% from the prior month and 1.9% from a year earlier. It is also due at 8:30 a.m. The Chicago purchasing managers index, for March, due at 9:45 a.m., is expected to inch down to 60.7 from 64.7 a month earlier. U.S. new-home sales for February are expected to climb to 620,000 from 607,000 a month earlier. The figures are scheduled for 10 a.m. The University of Michigan's consumer-sentiment index for March, also scheduled for 10 a.m., is expected to stay steady at 97.8. The Baker-Hughes rig count is slated for 1 p.m. The New York Fed’s John Williams speaks in St. Thomas, Virgin Islands, at 9:25 a.m., the Dallas Fed’s Robert Kaplan speaks at the Global Asset Management Education conference at 10:30 a.m. and Fed Vice Chairman Randal Quarles speaks on macroprudential policy at 12:05 p.m. The SEC delayed a program to rein in rebates in a win for exchanges. The Securities and Exchange Commission temporarily halted its own initiative to limit the rebates that stock exchanges can pay to attract investors’ orders. Wells Fargo CEO Tim Sloan is stepping down. The bank chief’s departure ended a 31-year career at Wells Fargo and an arduous 2½-year effort to get the company back on solid footing after a fake-account scandal erupted in 2016. Lyft priced its IPO at $72 a share, surviving a fundraising battle with Uber. Lyft, the ride-hailing underdog whose survival was once in doubt, priced its IPO at $72 a share in what could be one of the hottest initial public offerings of the year. A capital question is clouding Deutsche Bank merger talks. One of the big questions surrounding Deutsche Bank’s possible merger with Commerzbank is how much capital it might need to raise from shareholders to finance the deal. Morgan Stanley’s no. 2 executive will retire. Morgan Stanley’s second-in-command, Colm Kelleher, is retiring, opening a seat whose filling will signal the Wall Street firm’s likely heir apparent. The 4% mortgage is back. The average rate on a 30-year fixed mortgage was down nearly a quarter point this week from a week earlier, its biggest drop in over a decade. Campbell Soup: The food company said Les Vinney, chairman of its board of directors, will retire. RH: The home-furnishings company cut financial targets for the current year. Oxford Industries: The apparel company said fourth-quarter revenue rose less than Wall Street expected. Progress Software: The company said it is acquiring privately held Ipswitch for $225 million in cash.